The cakes are quick and easy to make – especially if you have a standing mixer – and would be great with whatever fruit is fresh, ripe, and in-season. Preheat the oven to 425. Combine the flour and baking powder in a large bowl. In a second bowl, beat the eggs until creamy and yellow, then add the buttermilk, vanilla, sugar, and butter. Add the flour mixture and whisk until well-combined and smooth. Divide the batter into 8 cups of a nonstick muffin pan. Bake for 9 – 10 minutes. While cakes are baking, combine the sugar and raspberries in a large bowl. Use your hands to gently combine. 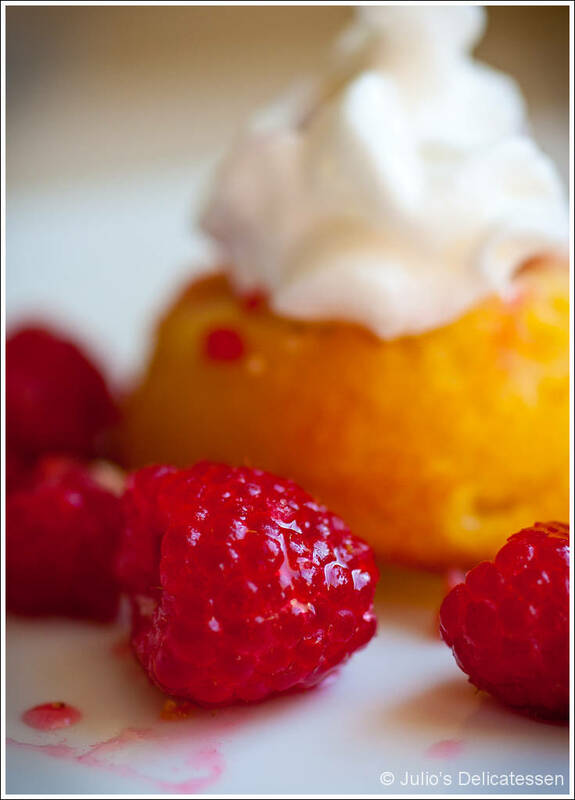 Invert cakes onto small plates, cover with the berries, and garnish with whipped cream.